I was in Paris for the first time last year. A highlight was going inside the cathedral. I'm surprised at the sense of loss I feel about this. It's really awful. Maybe, I'd say one of the monuments. Its harder to equate something in the US given the relative youth of the country and our landmarks. OK? No joke intended, it will not be ok. It may be rebuilt, but it will be different. And that has happened to the cathedral before. Hopefully, in another 900 years, this will just be one of its many chapters. It will be okay for most of the structure. Fortunately the fire started in the attic/on the roof/roof structure. Had it started on the ground floor (though there's less flammable material there compared to the roof structure) the heat from the flames and subsequent quenching with water would have had disastrous effects on the highly fossiliferous limestone building blocks. It is a very old, very historic cathedral. Beautiful, rich in history and tradition. This is sad, yet at the end of the day, it is a building. One firefighter was seriously injured, but no one died. At the end of the day, we should all be thankful for that. Yes. As Bash said, the roof (The Forest) is gone. That is extremely sad as it was an incredible and old piece of architecture. But the stone frame, the iconic towers, the structure itself is largely safe. The Rose windows are safe and intact. None of the pictures are linking nicely, but save for the rubble of the collapse roof in the center of the chapel, its actually startling how "good" the interior looks, all things considered. Artifacts and relics are all safe from what I was reading. Again, its tragic, but some people are describing it as if the cathedral has been reduced to a pile of rubble. Well, that's kind of how it sounded early when the firefighters couldn't reach the cathedral. Did you see the clips of the firefighters climbing in the side of Nôtre Dame, manually fighting fires along the way? It was incredible! The thing that is now gone (the roof and roof structure) may be the most difficult thing to replace. There aren't too many oak and beech trees around now that are large enough to produce similar size beams and posts. well, let some grow for another 50 years. they can just put a tarp over the roof for awhile. Yeah, that will go over well. Interestingly enough, it could take 18 years for them to rebuild it and that'd still be just 10% of initial construction time. On the other hand, we have engineered hardwoods and such now. and you risk losing UNESCO World Heritage status if you do that. For real though, what does that cost them? Are people going to stop coming to visit or something? Will it no longer be the seat of the Archdiocese of Paris? If the choice is between “rebuild in 5-10 years” and “there aren’t enough trees to let us rebuild in 75 years this in a way that keeps World Heritage status,” I have a pretty good idea which way they’ll go. People will still visit and the cathedral will still serve as the seat of the Archdiocese, but what it "costs" is a sense of history, culture, and place. More specifically, what you lose is much of the design, feel, workmanship, and artisanship. If the roof structure was merely a structural element then yeah, materials and design not true to the original would be fine. The roof structure however was not simply a structural element, as JWags has alluded to. It was a design or work of art that was highly visible to the public and an essential design element of the overall structure. Historic preservation and restoration has to stay true to the original design, feeling, workmanship, and materials. Otherwise history is altered or worse even lost. When Mount Vernon was restored they didn't slap vinyl siding on the exterior. In fact, there was a considerable amount of debate within the historic preservation community as to whether or not a HVAC system should even be installed. Macron says he wants Notre Dame restored within 5 years. It's going to take 5 years just for historic preservationists and architectural historians to agree on the appropriate materials and methods for the restoration. I guarantee those discussions and debates started before the flames were even put out and those discussions range between the use of original materials and construction methods to the use of engineered modern materials. 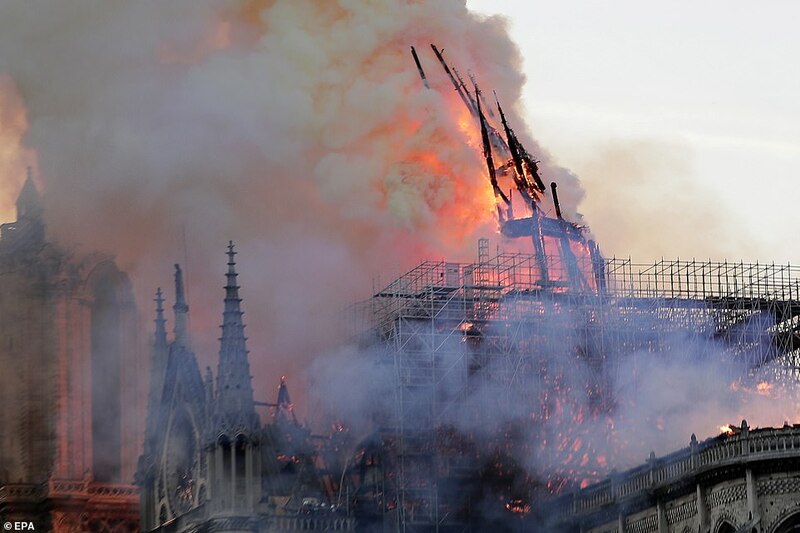 There is absolutely no way they can restore ND in 5 years with any kind of respect for the historic nature of the building and the architecture, and Macron is smoking something if he thinks there is. I doubt they'd be able to finish in my lifetime. There simply aren't enough people with the skill set necessary to do it right in that time. That's going to make for some interesting choices. As I see it, there are 3 options: (1) take the time to do it right and accept the fact that it may take 30 years or more, (2) try to make it look like it used to, using modern materials and techniques, and accept the fact that it will forever feel like a cheap imitation, or (3) scrap the idea of making look just like it used to and add a modern flair to it, like I.M. Pei's pyramid at the Louvre, and accept that traditionalists will be outraged.